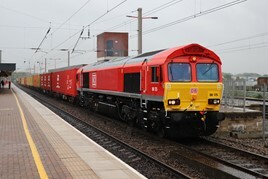 Peel Ports and DB Cargo UK have launched a new rail service for containers between the Port of Liverpool and Scotland. Commencing on May 8, it will run on three days a week from Merseyside to PD Stirling’s yard at Mossend, with room for more than 40 containers per trip. The return service to Liverpool will carry Scottish goods for export, with a large proportion destined for the US. One of the first customers to use this new service is Walkers Shortbread, which produces more than 40,000 tonnes of biscuits per year. carrying less than 6 containers per trip,unless more traffic is found this will be terminated soon.